For several years I've had this idea rolling around my head for a television show for kids & families. I remember growing up watching shows like Captain Kangaroo, Barnaby and Mr Rogers Neighborhood on television. Then watching Mr. Rogers again as a parent with my own children when they were young. As an adult I began thinking what a great resource his show has been for so many families over the years. 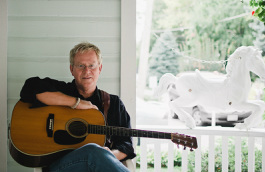 As I began developing my craft and found myself performing my music for family audiences I was surprised, and delighted, to hear parents comment they could see in me some of the same qualities I had admired in Fred Rogers. 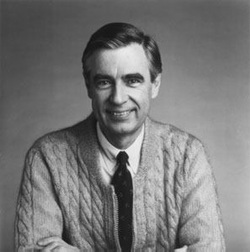 Mr. Rogers possessed a gentle, calming spirit with an unassuming, relaxed style. There was a sense of authenticity and genuineness about him. The fact that the character you saw on television seemed to be the very same person he was in real life always impressed me. He was also able to create a safe place for kids while making a point to communicate that he saw them as unique, one of a kind individuals, special, valuable and loved. I've tried to carry those same ideals through what I do... to always be myself, not a made up character but a real person. I've also tried to offer a gentle, relaxed style easily accessible and safe for children (and parents) and allow room for teachable, encouraging moments as well as laughter and hilarity. I'm also keenly aware, as I believe Mister Rogers was, that I am expressing and representing the heart of One who loves us with an everlasting love. When I look around at the landscape of children's television programming today I see some good things out there... but I'm also missing what Mr Rogers brought to the table and I'm wondering if perhaps the time is right to have something like that again. I'm not looking to re-make Mr Rogers Neighborhood, Once Upon A Porch will look and feel very different, but I hope it will carry the same kind of caring, genuine, gentle spirit that Fred Rogers brought to children and families. I've shared the idea with several friends and colleagues over the years and recently, with the encouragement from some friends and supporters who have a bit of experience in developing, promoting and launching projects like this, we've begun to put together a plan to pursue this dream making it a reality. Once Upon A Porch is a Web Series of episodes (webisodes) designed to entertain, inspire and encourage children 3 to 7 years old. My goal is to create a safe and nurturing environment where children will find inspiration, imagination and creativity along with their parents/teachers. Once Upon A Porch will strive to offer safe, high quality entertainment for families as well as a creative, educational resource for parents and teachers. At some point in each show I'll be paid a visit from the neighbor kids next door, Joey & Zoey (portrayed as puppets over the side yard fence). Joey and Zoey are both very creative kids who come from a very creative household. Their parents are artists. They're always excited to show me a new craft they've just made (kids watching at home will have the opportunity to make this craft as well with their parents/teachers if they like by downloading the supply list and detailed instructions that will be posted in the show notes on the Once Upon A Porch companion website). Another segment called "when I grow up" is where I'll introduce a special guest and interview them about what they do. We'll learn what it's like to do what they do... i.e. Pilot, Doctor, Carpenter, Bus Driver, Chef, Film Maker! Finally in each episode there's a visit from my Mail Carrier who is a typical California surfer dude named Surfer Dave. His day job is delivering the mail... but when he's not doing that he's looking for the next big wave! His mail delivery to me will include mail from viewers that I'll read on the show... it'll be kind of a Q&A / Show & Tell segment, answering questions kids might have, showing off some artwork or pictures of crafts kids have made or sending out a Birthday Greeting. The show will wrap up as it started with a song and me saying goodbye, see ya next time and heading back into the house. Note re. song with the band: When I do a song with my band... once during each episode... I'll go over to the garage, press the button to open the door and the band will be in there all set up... "garage band"... we perform the song (during this segment I'll be encouraging kids to jump and dance along with us because these will always be up tempo rockin' tunes. It'll end up looking a lot like a live concert music video in terms of the camera shots, edit cuts etc.) then when the tunes over we thank the guys, I press the button the garage door goes down as the guys wave bye... as if they are just in there all the time. The first phase of the plan is happening right now... We are growing a community of friends and families, a "Tribe" if you will, at the Once Upon A Porch Facebook page. As this community of friends continues to grow we'll be announcing the launch of a Kickstarter Campaign. I'm developing a five minute video pitch that will be submitted to a website called Kickstarter. If you've never heard about Kickstarter before or the idea of crowd funding or crowd-sourcing learn more about it here at their website. Once the project has been approved and listed with Kickstarter we'll need to get the word out to as many friends and fans as possible to get them excited about this project. I'll be asking for your help doing that to raise the financial backing to create the first series of Once Upon A Porch. I will be forming a support team and production team to help me create the episodes of Once Upon A Porch. I'm looking for talented, creative people who are passionate about creating something that will inspire and encourage children and their parents. If you have experience as a script writer, photographer, videographer, lighting designer, sound designer, production designer, stylist, filmmaker, television producer, public relations and marketing professional, etc. and would like to be part of the team to help make Once Upon A Porch a reality... well, I would love to hear from you.You can reach me through the contact page here on the website. Our plan is to produce a series of episodes for the internet (webisodes) that will be available online through You Tube as well as a interactive companion website connected to those episodes where we will create additional content/resources for families to interact creatively and educationally together. The idea here is to create 10 episodes to be broadcast over the internet along with the companion outlines, show notes, activities etc. featured on the website each week. After those 10 episodes air we will package them along with the notes and activities into a DVD format that would also include some bonus features not available online (i.e. music videos, behind the scenes interviews, outtakes etc.) and make this available to families as well. In some of my research I'm learning there are very real differences between shows produced for the web and shows produced for the television... in terms of the kinds of camera shots and production values the difference is huge and that translates to less expensive production costs. Another big difference in cost of production between the two is length of each episode. Where a typical network show is 22 minutes plus commercials a internet TV show is 5-14 minutes long… the reason behind that is the way the shows will be accessed by viewers… mostly through mobile devices, (iPhones, iPads, and tablets) this is the new medium for viewing video content. Newer televisions are now actually designed to connect to an internet connection so you can access the kind of internet programming we’re planning to create. So that's the full scope and vision of the project... I hope you're excited and inspired to be part of this adventure. It would be impossible for me to do this all by myself. It's going to take lots of friends and families to make this happen. The truth is that is how it has always worked for me. I'm doing music for kids and families today because of the generous and enthusiastic support from friends and fans like you. The people who have purchased music, booked shows, spread the word, made a contribution and offered kind words and prayers for me over the years is what has kept me going. Faith, Hope and Love... wonderful gifts, given to us, operating in our lives everyday to create miracles. I'm asking you to consider adding your gifts to the gifts of others, let them loose and watch them work together to create something good, something amazing, maybe even miraculous for children and their parents. Become part of the "Porch Culture" on the "Once Upon A Porch" Facebook Page.